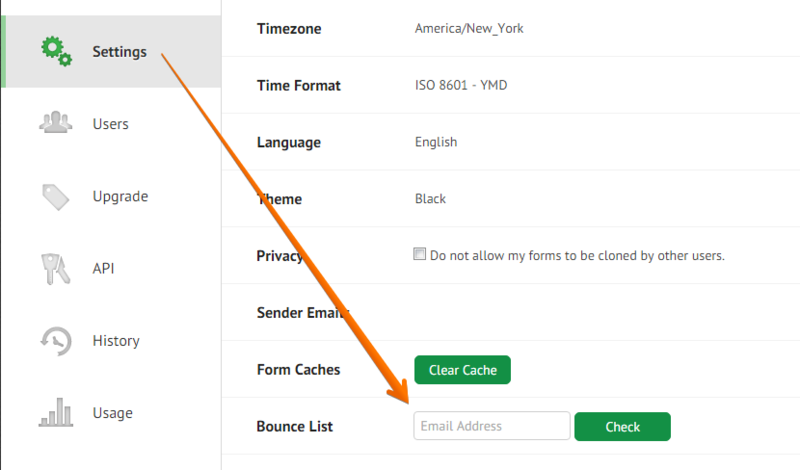 There are several reasons why your email address may have been added to the bounce list. It could be due to a non-existent/inactive email address, your mail server being unavailable, your email server has rejected the emails due to suspected spam, your mailbox is full or JotForm is on your blacklist. 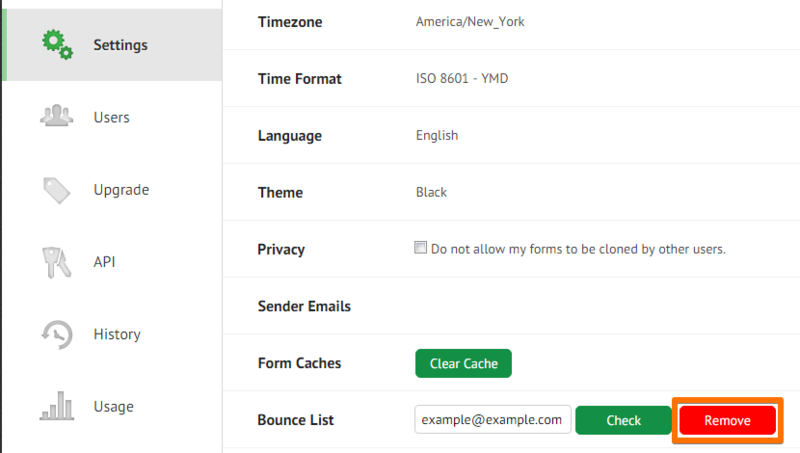 JotForm will stop sending emails when your email address is on the bounce list. Please note that high bounce rates will put our sending method at risk so we have to process the bounce messages without exceptions. 1. First make sure you're logged in. Click the AVATAR icon at the top right, then click the GEAR icon. 2. Go to SETTINGS > BOUNCE LIST and enter the email address you want to check. 3. If you find out that your email address is in the bounce list, just click the REMOVE button. That's it! You should now receive emails when someone submits your form. If your email addresses are being constantly added to our bounce list, our best recommendation is to switch your email notifications to your own SMTP sender. The bounce messages will be processed by your mail server in this case, so the email addresses will not be added to our bounce list. Please would you kindly remove my email account from bitbounce , dont want to subscribe anymore. Sir please delete my bit bounce account. I have 2 accounts on bit bounce. Sir please delete my 2 accounts. I want to remove the following email address completely from bitbounce. I want my email taken off bitbounce i never wanted it. I have not been able to get emails because of it, saying the person will get charged in order for me to get it. "I want to open this account". Please help me." Comment Pls remove bit bounce frow my email completely. Tnks. Please remove my email address from bitbounce list now, I'm almost loosing important mails because of bitbounce, I'm not interested anymore. please! please! pls my email is Emmycode3x@gmail.com, am tired of your service, i want to opt out. I don't want to be member of bitbounce email address anymore. Checked that and still not working. I get the test emails from the form but not from ANY submissions!!!! I have just bought an email list. How can I sed a mass message with jotform. I am not receiving the password reset link. can jotform whitelist email addresses on our system? I get 2 to 4 emails a day from my form with no issues, nothing being blocked or marked as spam, yet I still get added to your "Bounce List" every other month. I know there is nothing wrong with my email account or the way my email address is entered in the form, otherwise I would not receive submissions multiple times a day. I can see that many other users are having issues as well, there is obviously something wrong on your end. I no longer refer clients to your service because of this and I am currently changing the ones I have previously referred to you to other types of forms, once completed I will most likely no longer use your services myself. This issue is not good for business, if you value your customers it should be corrected.